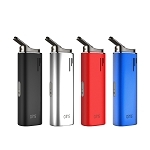 The Airis Herborn Vaporizer is a premium device intended for dry blends that offers an ultra portable size with adjustable temperature options and an impressive 30 second heat up time. It measures in at just under 4.2 inches long by barely over 1.5 inches wide, leaving you with a pocket-friendly device that isn't going to weigh you down everywhere you go. 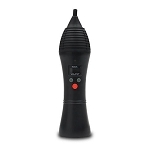 Using the Herborn Vape is meant to be a quick and simple process. You have a bottom food grade ceramic heating oven with magnetic cap that allows to fill up and reassemble in a matter of seconds. 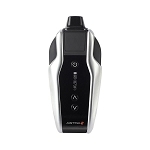 After it is filled, the Airis Herbron Vape is easily controlled using a single button. Press it five times to power it on and then every single click following changes the temperature control options. Airistech provides you with three preset temperature settings that are designed to deliver peak performance across a wide range of different dry material types. The LED light indicator above the power button helps to keep you informed during your sessions. While heating it will flash one of three colors to indicator your desired temp setting (Green 420°F, Blue 435F, White 450°F) and when the temp is reached it switches to a solid color. Airis also includes an innovative Haptic notification system that vibrates the entire device when it is ready for use so you will never miss a beat. Give it another 3-4 seconds after the vibrate and then you are good to start inhaling from the silicone mouthpiece lid. Inside the device there is a premium lithium-ion battery powering your cycles at the touch of a button. 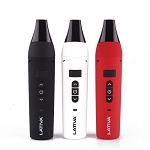 It has a massive 2200mAh capacity for easy all day use and sports a convenient USB charging method with passthrough option for those sessions in a pinch. Grab your Herborn Portable Vaporizer today in four color options and enjoy your favorite dry material anywhere or anytime with ease. 8 points worth $8 will be earned when you buy this item.